At the invitation of race organizers, halau members greeted competitors in the Kaua`i World Challenge Canoe Race on 7 May. The paddlers, in one-and two-seat outriggers, left Wailua early that morning, and finished at Hanapepe’s Salt Pond beach in the afternoon. Teams rotated at Hanama`ulu, Kalapaki and Koloa; this allowed competitors to rest, and made the event more visible to land-based spectators by compelling the canoes to come ashore at several points along the course. Paddlers, among them our own Sharon and Ricky Balidoy, came from as close as Hanalei and as far away as Australia and Europe, making the event worthy of its name. An international organization with Hawaiian roots, Ka `Imi was well-suited to represent the event’s host culture. 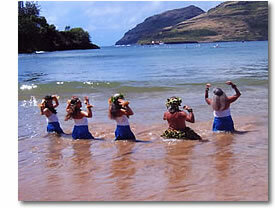 O`ahu, capture its refreshing spirit.